A young child and her mum were both injured by an out-of- control Staffordshire bull terrier after it attacked their dog, a court heard. The dog’s owner, who was out at the time and told police he “did not care”, has not been charged but his pregnant partner, Kerry Bowman, who had been at home, was prosecuted. Judge Neil Flewitt, QC said that Paul Lyskiewicz was the primary custodian of the dog. He imposed a community sentence on 31-year-old Bowman, who is expecting her fourth child, and made a contingent destruction order on the brown and white dog which is now in the care of the Carla Lane Animals in Need charity. Liverpool Crown Court heard that the 10-year-old girl was walking her small pet dog along Central Avenue in Haydock on May 14 last year when the much larger animal, which was alone and not on a lead, approached them. 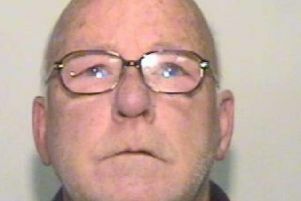 “She picked it up to protect him and the Staffordshire bull terrier proceeded to bite its back leg, said Frank Dillon, prosecuting. She began screaming and her 11-year-old brother ran over and tried to get the dog, Toby, off their pet. Their mother then appeared and also tried to get if off without success and was bitten by Toby on her right arm suffering a superficial puncture wound. The little girl had been bitten on the hand and suffered bruising. A nearby resident joined in along with the girl’s dad and they managed to get Toby off the injured dog. Police arrived and called at the house in that street where the bull terrier lived, said Mr Dillon. The door was opened by Bowman who said that the animal belonged to her parter, Paul Lyskiewicz who was not in. She said the garden was insecure and she had asked her partner to fix it but he had not done so. Officers found a thin black dog which appeared afraid in the premises. The rear yard was full of rubbish from ripped open bin bags and dog faeces, with the smell described as “horrendous”. When interviewed Bowman described the dogs as family pets and said they lived in a pen outside and she had not realised that Toby had escaped. She said it was her partner’s job to clear up the dog faeces. Bowman pleaded guilty to two offences of being in charge of a dog which caused injury while dangerously out of control. Mr Dillon said that the little girl was left suffering from nightmares and her brother had sleepless nights. The court heard that Lyskiewicz, who sat in the public gallery, had agreed to sign over ownership of the dog to the Carla Lane Animals in Need charity and the couple’s other dog, a stray they had taken in, has been rehomed. Toby had never had any formal training and a contingent destruction order made by the judge includes him being neutered within 14 days, having a minimum of 10 obedience lessons within the next three months, always being on a lead in public and not being rehomed where a child under five lives. He sentenced Bowman, who has three children under the age of three, to eight months imprisonment suspended for 12 months and imposed a three-month curfew with a tag between 9pm-7 am. He said that at the time they were living in temporary accommodation which was not in good condition which he accepted may have been out of her control. She had been concentrating on looking after her two young children and visiting her third premature child, to whom she had given birth 10 days earlier, in hospital rather than focussing on the dogs. He said that fortunately the injuries were “relatively minor” but pointed out that situations involving dangerously out of control dogs can result in serious injury or even death. Michelle Brown, defending, said that Bowman did not know how Toby, about whom there were no previous concerns or complaints, escaped.